Breckland Beira first shown to public at Motorexpo, Canary Wharf. New 400bhp British-built two-seat roadster. Dual-fuel. On sale from November 2008. Norfolk-based manufacturer backed by Hong Kong-based Riche Holdings. The Beira is a hand-built, two-seat roadster with unique styling cues, based on proven GM architecture and powered by GM’s LS2, 6-litre V8 engine, tuned to produce 400bhp. Weighs 1,400kg. Sub-five second sprint to 100kph, coupled with tremendous torque and a governed top speed of 155mph. Runs on LPG with a range of 700 miles between refuelling stops. Based on the General Motors Kappa platform, on sale in the North American market. The fuel-injected, aluminium V8 and Tremec six-speed manual gearbox are neatly packaged under the Beira’s swooping bonnet, with a bespoke wiring harness and ECU, the latter being reprogrammed to allow the V8 to deliver close to 400bhp, combined with a dual-fuel capability. The fully independent suspension was entirely re-engineered by Breckland in association with KW Suspension, with uprated springs, dampers and bushes, plus thicker anti-roll bars front and rear. The result is slightly less suspension compliance, but a more focused ride and handling. 325mm ventilated discs on all wheels, six-pot front calipers, four-pots at rear, both from UK specialists, HiSpec. Steering is via power-assisted rack and pinion, whilst the 18” cast alloy wheels are 8.5” front and 9.5” rears, shod with Bridgestone ultra-low profile tyres. Customer options include an upgrade to 19” diameter rims and tyres. Despite the inclusion of an additional 70-litre LPG reservoir to go with the existing, 13-gallon petrol tank, the Beira features a significant increase in usable luggage space with the hood down. GM steel doors are used to ensure excellent side-impact protection and good sealing properties, while crash protection front and rear is provided by transverse aluminium crush structures attached to the hydro-formed steel chassis. Both front and rear bulkheads are steel to provide rigidity to the windscreen and hood. Beira features a custom-built interior, including electric windows, air conditioning, twin airbags - in the steering wheel and in the passenger dash - combined with clear, concise instrumentation, and hand-stitched leather/Alcantara seats and trim. The central instrument cluster incorporates a double DIN showcase of mobile entertainment from in-car specialists, Clarion. Its immense specification includes a 7” TFT colour touch screen, DVD player, direct iPod and Bluetooth connectivity, and an in-built 30Gb hard disk drive (HDD) navigation system with full European mapping. Beira buyers can also opt for the rear reversing camera, which relays the view behind onto the same in-dash display. A GM manual cloth hood with heated rear screen is retained on the Beira and, when folded down, stows quickly and neatly out of sight under the deck lid for a smooth, integrated appearance. This is further accentuated by the sculpted deck lid, incorporating individual fairings behind driver and passenger. 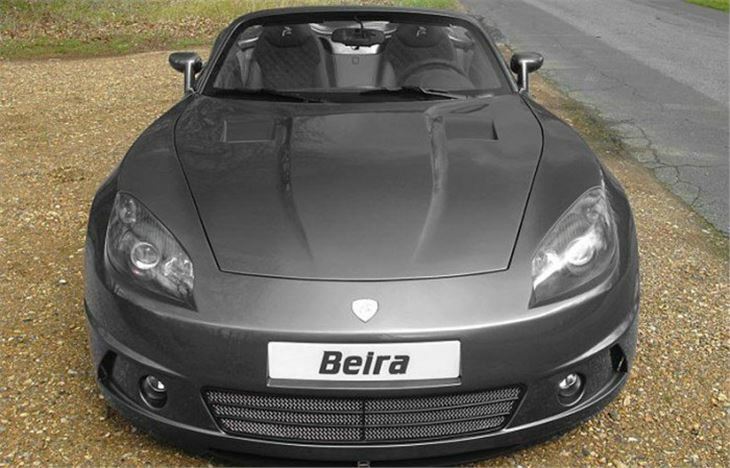 The Breckland Beira on-the-road price is expected to be in the region of £55,000 in the UK.